Anyway, as the itinerary and planning was not done by us, this entry might sound a little haphazard at some points. If that’s a problem, you might want to skip just to the pictures to get a brief overview of what we saw. What awaited us on the other side was, utter chaos. Throngs of touts were surrounding us, trying to get us to purchase a tour. If you replaced shoving of tour catalogues in our faces with shoving of cameras, we’d have felt rather popular. You know, like a whole group of groupies had been waiting for our arrival for hours. Our guide managed to drag us out of the inferno of touts, and got us on the hired tuktuk to our destinations around Tachilek. 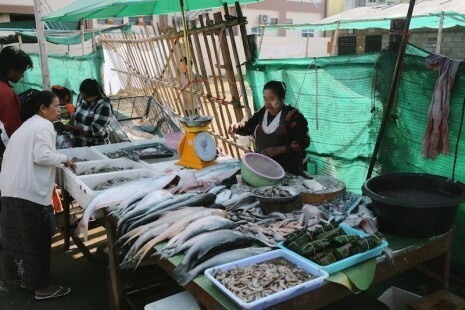 We started by walking around the wet market and seeing the locals go about their daily lives and buying fresh produce from vegetables, to seafood. Then there’s the “dry market” with all the clothes, shoes, and toys (Mostly made in China). At one point, I thought I’d gone mad or been granted my wish of speaking every language in the world, because I understood what these Burmese shop owners were saying, but soon realised that they were just speaking Burmese-accented Chinese. Meh. The local women believe wearing the special paste on their face, keeps the skin cool and fair. I have to say though, the people there were so polite, human traffic jams happened all the time. Basically, if you stopped to look at something in the narrow streets, the locals behind you literally stop along with you, not shoving you nor screaming at you. Well, at least that’s how it was when we were there. I was, impressed. Right after, we also visited a local temple, and the smaller version of Schwedagon Pagoda up on a hill. The ride up was interesting (and steep), passing by little homes, catching little glimpses of life. 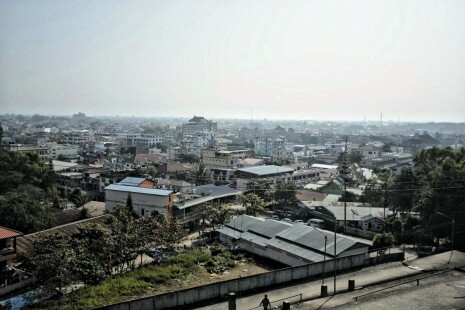 From the pagoda, you also get a pretty extensive view over the town of Tachilek. 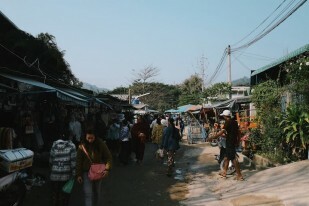 Coming back into Mae Sai, avoid the long queues that the Thai/Burmese people queue up at. They use a separate line for these two nationalities. Foreigners will be called to use the empty line. Take your passport, and leave. We didn’t do any shopping in either markets. But if you do intend to shop, our guide mentioned the prices in Mae Sai market and Tachilek market is of negligible difference. As Mae Sai is the quieter market, you might want to buy your souvenirs, tidbits, and fruit wines (lychee, strawberry etc) there instead. 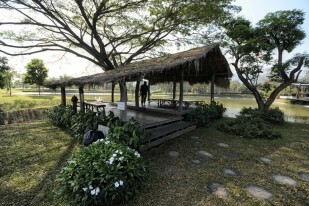 We were then driven to a quiet location for our picnic lunch (food prepared by the resort earlier). Garlic Fish with Glutinous rice, Ham & Cheese and Club sandwiches, Beef and Asparagus, Pad Thai, Fruits, etc. As usual, there was too much food, and we fed the rest of the bread to the fishes instead. 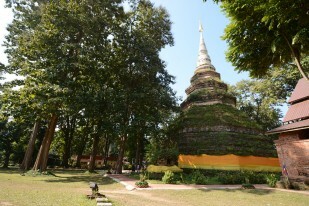 After lunch, we headed to Wat Phra That Chedi Luang, an old pagoda in one of the discovered ruins in Chiang Saen. It was believed to have been erected by the third Lanna King, King Saen Phu. The quiet town used to be a bustling capital city, but most buildings were destroyed (like the royal grounds in Chiang Mai, and Ayutthaya) by the Burmese in the 16th century. 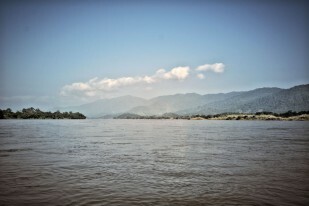 We boarded an open-air, small long-tail boat towards Don Sao Island via the Mekong River. The ride was pretty bumpy – I was pretty sure the boat flew off the river multiple times. The landings back onto the water always felt like naughty little slaps on the behind. We passed by the Laos mainland though we didn’t disembark there as we’re not allowed to, without a proper visa. Don Sao Island, however, has no border control or immigration office, and is basically open to all. Many boat slaps and giggles later, we arrived on the island. It was probably the quietest place out of the three main locations we’ve been. But it was once again, just a tourist market. 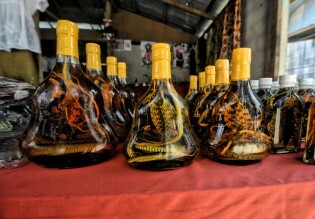 There were some interesting items for sale though – snake whiskey, scorpion whiskey… I was extremely attracted to the shawls there, however. They were actually the usual Pashmina shawls you get at almost anywhere but somehow the ones here had prettier designs, and were cheap (around 2euros/3.50sgd). I got some for a friend, and one elephant design to remind me of the elephants at the GTAEF camp. After a short walk around, we got back on the boat for a ride around the Mekong River – probably my favourite part of the tour. 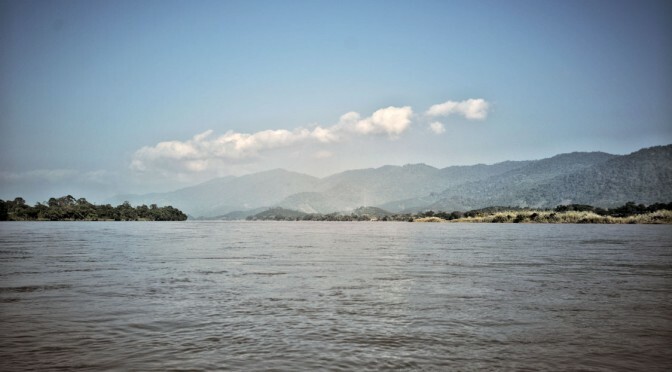 We got to see people bathing their pets and children in the river, passed by the casinos of Burma and Laos, had a beautiful unobstructed view of the mountains in the distance, and finally back to our beautiful resort via the Anantara Boat Pier. Washing clothes by the river. Our boat pier in the distance. 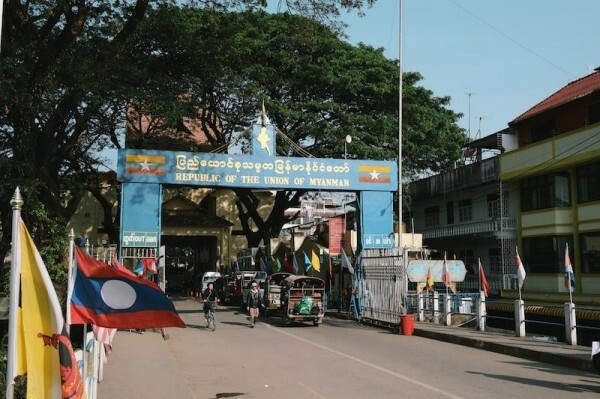 // Border crossing into Tachilek: You don’t need any special visas into Burma from Mae Sai – but you’re only allowed a 6am-6pm within the same day, entry and exit. And they’ll hold on to your passport, just to be sure of it. You’ll receive a piece of paper with your picture on it (which they’ll snap of you in a special room), your passport details, and code. This paper would be used to retrieve your passport returning to Thailand. Upon entering back into Thailand, you will receive a new visa exemption of 14 days. This might be good news if you were looking to extend your stay in Thailand, or might be bad news if your itinerary stretches over 14 days.